The LARISSA Glaciology team continued to get things done in the Larsen B embayment over the past week, but at this time of year the region has a very frustrating weather pattern. Snow, fog, mist, and even drizzle can shroud the area for a solid week. The majestic Melville Coast emerges from a thinning haze. After several days of heavy snow at the Flask AMIGOS site, we awoke to a gradually clearing mist on February 13, and prepared to move fast. 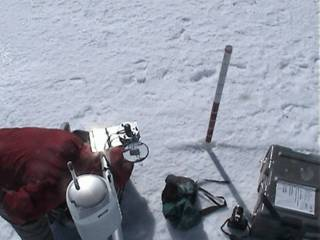 Terry Haran and Ronald Ross returned briefly to the previous site at the crest of the ice cap, to re-connect a sensor that failed during our last hour of installation there. 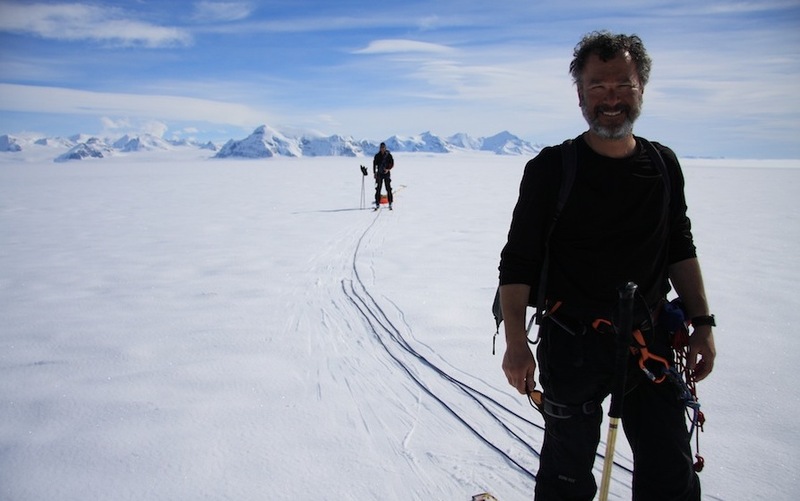 Meanwhile I, Martin Truffer, and Erin Pettit, moved to a second glacier, the wide but relatively smooth Leppard Glacier, to install a continuous-monitoring GPS system. By flight time the weather was excellent: clear, sunny, and dry with light winds. The flights went perfectly, and within one hour we had the teams at the two sites and making progress. But through it all, to our east, we could see a grey formless shape, a hazy pancake of fog lurking over the shelf. We worked like an assembly line on the Leppard Glacier GPS station, the team barely needed to speak as we worked: this tool here; that method works best for this, here’s this idea to avoid the problem last time, but the fog rose like some inexorable hand, slithering up the glacial valley. How long would it be this time? How long would we be stuck? Worse, we were now a split team again. Terry and Ronald could not rejoin us at the next site, the Scar Inlet Shelf, the lower site, in the center of the fog. The Scar Inlet is the last vestige of the Larsen B ice shelf—less than 20 percent of a shelf that in the 1980s rivaled the size of Connecticut. Scar Inlet is the southernmost bay of the shelf, and therefore in a slightly cooler climate that the areas that broke up earlier. Its potential for collapse in the next few years, should warming continue even a little, is the driving motivation for our work. Can we get instruments on it ahead of time, and track both the processes of break-up, and the response of the glaciers? In 2002, both of these were stunning: a massive shattering disintegration of a thousand square miles of shelf ice, 700 feet thick, in the space of just a few weeks, followed immediately by a surge of all the glaciers flowing into the affected area, to as much as six times their speed prior to the event. Only the Scar Inlet ice remained; only the Scar Inlet glaciers were un-affected. Scar Inlet stands at the front line of climate change in Antarctica. As we hunkered down in our tents on Leppard Glacier on the night of February 13, fog and darkness shrank the world to just two dome tents. Scar Inlet seemed beyond our grasp, a prisoner of a colder, damper summer than most. As I said, Scar Inlet is on the verge of collapse, rent with shallowly buried crevasses, because melt in summer removes nearly all the winter snowfall. But we had no idea just how precarious the situation was. As part of building camp, Terry dug a pit, to “accumulate food wastes,” shall we say, and nearly lost the shovel down a narrow crack about 50 feet from the tents. We took it seriously. 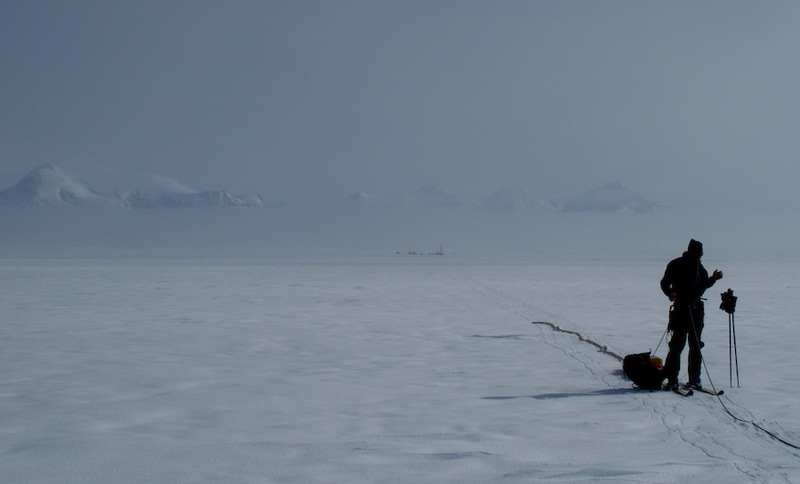 Erin put on skis and her harness, and with Martin watching, she probed the area around camp. 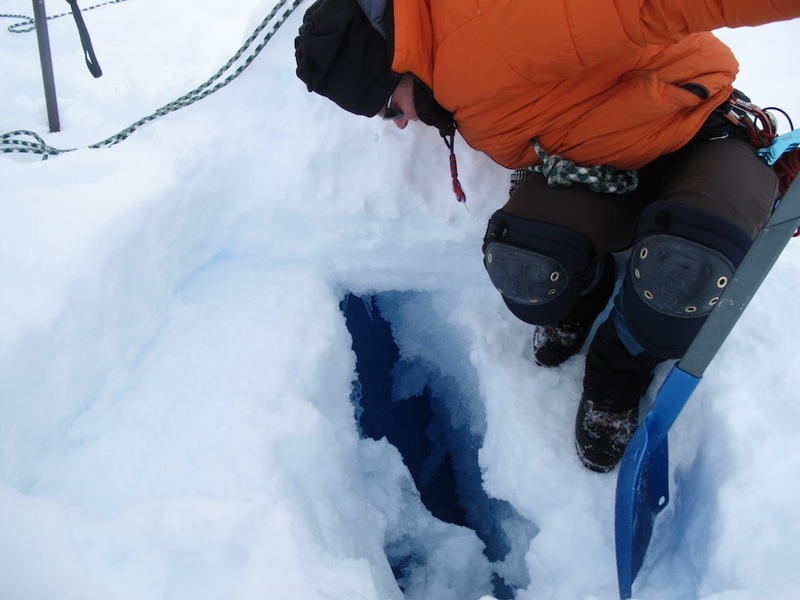 We found one part of the crevasse that might be wide enough to pose a hazard, and marked it. Overall, the camp seemed safe. Traversing with the radar that evening, we probed on skis for 6 kilometers (4 miles) to the north, and found no more weak areas. Needless to say, we dug a different pit. Erin probes the ice fracture outside of camp. February 15 was cool, dismal, even dank, as the fog and clouds closed in again. At this low altitude, just barely above sea level, the air felt heavy and wet. We had seen nothing beyond the runway flags, except occasionally the lowest parts of hazy rocks in the distance. For the most part, we were once again floating in an infinite grey ball, with no horizon. But we worked continuously to get the AMIGOS station in, and by 9 p.m., we had raised the tower and secured it, digging three deep pits and a central large pit for the anchors and the tower base. The next day, we sensed a change. The mist was thinning. The sun was still obscured, but too bright to look at. We saw shadows for the first time in days. Not quite flying conditions, but close. We radioed a report on the trend to the pilots at Rothera Station, and then took off quickly for a second radar survey. About a mile out of camp, it happened. Behind us as we skied, the fog began to thin to nothingness, and a stupendous landscape emerged. Martin was the first to notice it, as he knelt to adjust the radar system. It was as if we had been standing in a national park, a world heritage site, that had been hidden behind curtains. The satellite images could never do this justice: Leppard and Flask glaciers flowed down toward us, past a giant rampart of rocky peaks to merge at our feet into a vast plate of ice. In the harnesses, we were giddy: we stopped, snapping pictures, laughing and joking. Our camp seemed like a few fallen toys on the snow at the foot of the range and glaciers. I’m sorry: I just could not get it all to fit into the camera. The majesty of the place was beyond recording. Ted and Martin Truffer ski across Scar Inlet. But February 16 was to be a roller-coaster day. As we skied back to camp, looking forward to a return to Rothera, we noticed something odd about the AMIGOS tower in the distance. There was a large black lump clinging to the side of it. Skiing closer, we could see that Terry was near the top of the tower. Something was wrong. As we got to camp, we learned that the camera on the AMIGOS had failed sometime after we hauled the tower upright. Fixing it would require hours, and even that was not certain; and the planes would arrive within 45 minutes, and they could not wait. Wow. To have all this to look at, and all the events that might indicate an impending breakup, and no eyes on the AMIGOS. Ronald informed us that there was no way he could fix it out here, and so dejectedly, we removed the camera from the system. The planes arrived. The distraction of the broken camera, and our long ski back from the radar traverse meant that we were completely unprepared for them. Camp was still scattered and unpacked. But the pilots pitched in, (I want to say: outstanding pilots, Richie Cameron and Dave Edenborough, both in flying and in supporting the science work), and began to help us pack the two aircraft. That is when the second stunning event happened. We had been at the camp for three days, stomping around everywhere, and had skied for kilometers, finding just one narrow crack. But as one of the pilots dragged some heavy cases across the snow, we heard a shout – and turned to see him waist deep in a 2-foot-wide crevasse. The chasm was nearly black at the bottom, at least 20 feet; it was a “dead” crevasse, formed upstream, and the sides were coated with icicles and frozen rivulets of water from previous summers. The pilot was shaken, unhurt, but the shock of it drew us down even further. Martin probed a safer route, and the mountaineers and I did the rest of the packing, on skis for safety. Erin found some food in her pack, crackers ground nearly into gravel, chocolate, and some cheese. It would have been trash by any ordinary standard, but by this point Terry and I were in full ‘field mode’: this was food, and we were hungry. Terry and Ted enjoy a much-needed snack. By the time we landed, the song had switched to “Fanfare for the Common Man.” That is how to fly over the Peninsula landscape. We are now waiting for a flight from the British base to rejoin our colleagues aboard the Palmer. Ronald Ross and Terry Haran work on setting up the AMIGOS station on Scar Inlet. When the mist cleared, the team saw a landscape worthy of Melville’s power. Ishmael Peak rises through the fog. 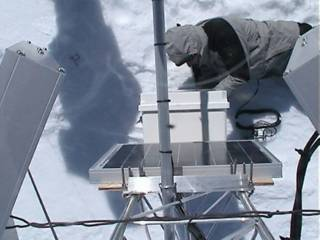 The Leppard Glacier GPS will monitor tiny changes in ice flow. Martin Truffer adjusts the radar system. It began with a haziness, an odd light, at midnight on the fourth day. There’s an old saying about the color of the sky at sunrise and sunset. But what if sunset happens at midnight, and it’s also sunrise, at the same time? An ice fog blew across the camp, flocking everything with feathery or bristly crystals. Rothera told us by radiophone to prepare for the worst. To our surprise, the next morning was still fair enough to try to finish the last of the survey. Rob and I suited up, and managed to drive about 20 km of data before our batteries ran out. We turned back just in time. 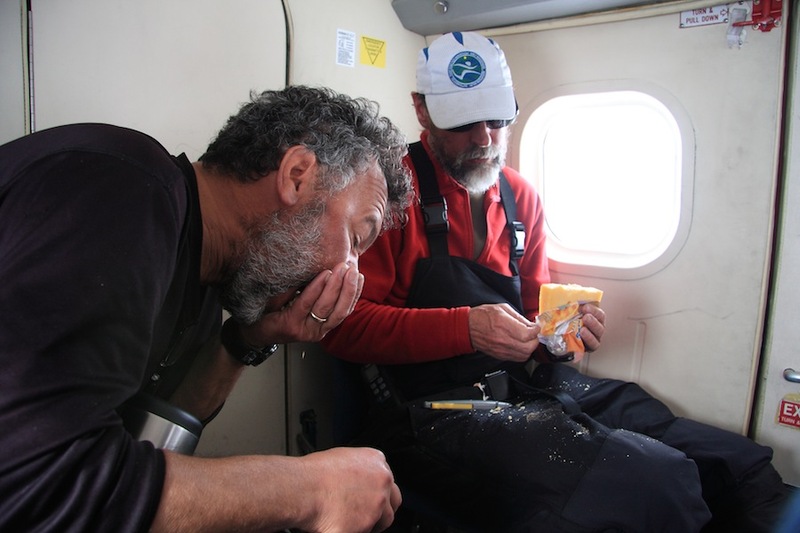 By 2 p.m. the wind had risen to 30 knots, and we were shouting over it to tie things down, close things tight, get supplies and gear where we needed it for a long wait. We dove into the tents at 3 p.m., and then the weather really broke. By 4 p.m. the wind was howling at 45 knots, snow was screaming past the plastic windows of the tents, and huge plumes of drift streamed away from each tent, as if each were the head of a comet streaking across the sky. If you’re wondering, we peed in bottles. As for anything else, well, we waited. On the following morning, Rob and I decided to go over to Erin’s tent, despite the storm, and have a ‘proper breakfast, dammit’. We suited up, tightly, tied the boots on, and pushed on the fabric tunnel door of the tent. It was buried. To get out, we had to kick our way out, or shove against it like a football player. The wind (we were later told) had reached a maximum of about 60 knots. Having kicked a path clear in the door, I crawled out through the short tunnel doorway and looked up. Instantly I was gagged by snow, blinded as well, and staggered by the force of the wind. Erin’s tent was a hazy outline flickering between gusts, barely visible but just 30 feet away. The camp flags were flapping at an impossible staccato pace no rock star drummer could ever match. I stood (I was not going to crawl), took a step, and immediately stumbled. Crawling might not be such a bad idea. There were new ridges and ditches everywhere, the camp landscaping was completely redone by the blowing snow. Each tent had its own crater forming around it, and the snow ridges on either side were 2 feet tall. Boxes had disappeared. The main sled had disappeared. There were flagpoles that had snapped in the wind. There was no horizon, no contrast, just vague shapes, like a tent or a box, emerging from a grey-white shrieking haziness. Rob and I staggered over to Erin’s door. It too was buried, but the shovels were still there by the door where we had staged them prior to hunkering down. For the next 12 hours we sat in the tent, cheery, not exactly warm but at least with food and a stove, and computers to look at. Slowly, in the storm, the data was processed, and a report was written on the region. We found the site we needed. And in a gap in the wind of 8 hours the following day, we were pulled out (at the last possible hour to make our flight north). 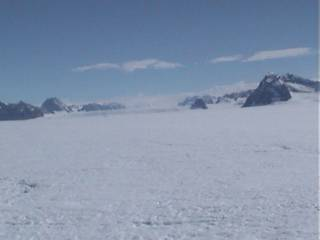 Erin, Ted and I are out of the field and are back at Rothera Station. The previous two days, we were basically tent bound, trying to stay out of the to 50 knot winds, blowing snow, and zero visibility. Richie and Dave flew the Twin Otter to the field site during a brief break in the weather. 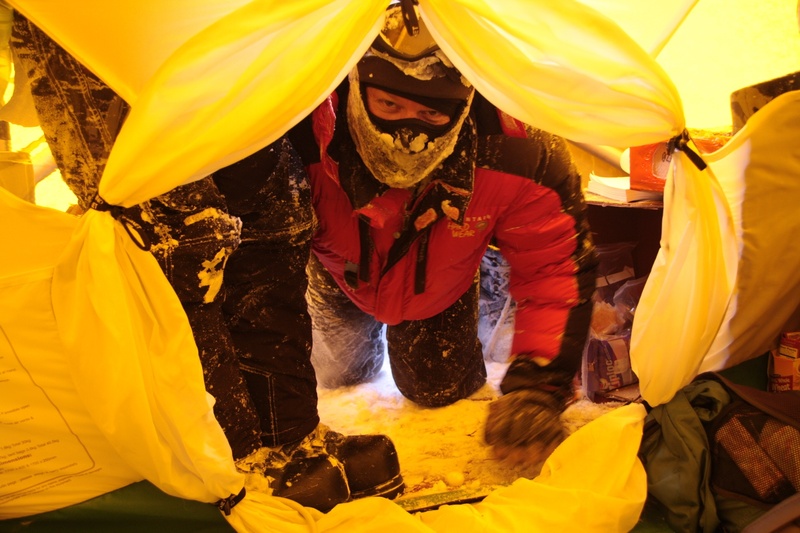 With their help and assistance from two British Antarctic Survey members, Allen and Andy, the team managed to break camp and beat the weather. A science update will follow shortly, outlining our results – stand by!